The 33rd Inspector General of Police retired on Monday, leaving space for the appointment of the next most suitable officer as his successor. Although the appointment of a Police Chief lies within the discretion of the President, the recommendations that would be made by the 10-member Constitutional Council are vital. 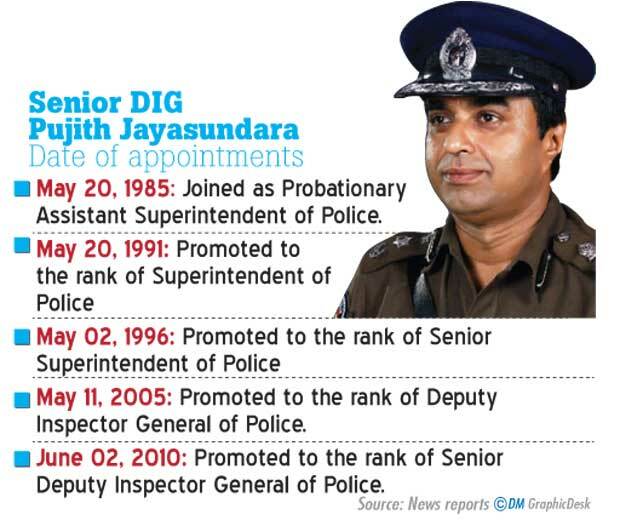 When focus is much on the decision taken by the CC that is scheduled to sit next Monday, a cold tussle could be seen between the two main contenders to the top post -Senior DIGs Pujith Jayasundara and S. M. Wickramasinghe. 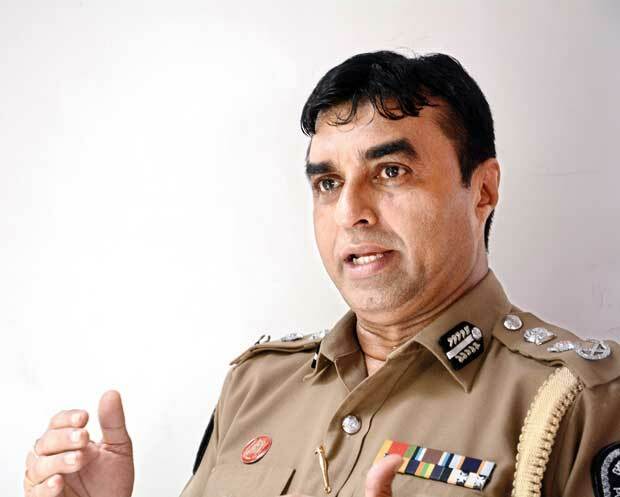 The Daily Mirror had the opportunity to speak to one of the determined officers, Senior DIG Pujith Jayasundara, who believes that a people-friendly Police force could be established only through earning good reputations for the Police officers. Q What is your full name and the date of birth? My name is Pujith Senadhi Bandara Jayasundara and I was born on March 15, 1960. Q Tell us about your early life and the family background? My hometown is Kurunegala and I was the only child of my family. My father was Ranbandara Jayasundara and he worked for a leading electronics and radio appliances manufacturing company in Colombo. My mother was a housewife. They both passed away sometime ago. I had my primary education at Thaksala Maha Vidyalaya in Mahamukalanyaya in Bogamuwa. When I was in grade five, my parents admitted me to Ibbagamuwa Central School on the influence of my two grandmothers. After six or seven months I was fortunate enough to join Dharmaraja College in Kandy in 1969 with the help of my uncle. My father’s first cousin Keerthi Amunugama, who was living in Kandy, who got me the opportunity to enter this college. After that, my entire career was based on the life I had spent at Dharmaraja College. "The HNDA student protest.. caused much an uproar. Apart from being in charge of the security of the Western Province, I was being appointed as the Acting IGP during this period, when I had to make sure the peace of the society would not be disturbed"
Q What are the educational qualifications you hold? What were the sports and extracurricular activities you did at school? During that time I was staying with my uncle, who was working at the Kandy Kachcheri. As he quit Government Service after a few months and joined Tulhiriya Textiles and had to leave Kandy, I had no option but to admit myself to the college hostel. Since latter part of 1969 until 1978, I was in the hostel. My hostel life changed me a lot. You have to strictly adhere to the hostel timetable, which is not easy as when you live with your family. I still remember there was a strict warden at the hostel named Mrs. Mohottigedara. You had to wake up early in the morning, do your studies and engage in sports activities, which were also compulsory. So, I started playing soccer for the junior team and that was my first sport. After that I started to play cricket and joined the Under 16 Cricket Team of the college. I sat for my O/L exam in 1974 and got through it at the first attempt. And then I sat for my A/Ls in 1977 but soon after the exam I felt that I did not do well. It was the cricket season and I was studying amidst practising. It was because of my efforts to achieve them that resulted in whatever as grades I got. We had to constantly travel to Colombo to play cricket with Colombo schools. I was given special permission to carry my schoolbooks to the match and to do studies for two hours after the dinner as I was studying for the second attempt whilst playing. Even when I was making the second attempt, I was granted permission to stay an extra year in college, with special consent of the Ministry and was not even charged hostel fees, because I was engaged in many social activities during the school years. 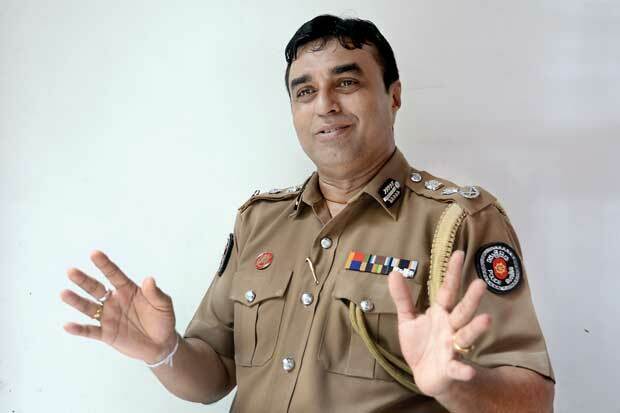 Outgoing Police Chief N. K. Illangakoon recently made an eye-opening remark that he never went behind anyone for the post of IGP. There are strong allegations that you and your competitors have launched various campaigns to get hold of this position. What do you have to say about that? Well, that was his personal view. But I must strongly deny the allegations about the campaigns carried out for the post. When you do your duty rightfully, according to your conscience with a correct sense of mind, no force can prevent you from achieving your goals. Q You had a wonderful school career with a colourful sports background and a bright future ahead with a second class (Upper) degree in Management. What inspired you to become a Police officer? When I returned home after obtaining my degree I had engaged in many social and welfare activities in my village. One day, my mother’s brother brought a newspaper with a Gazette notice mentioning recruiting degree-holders direct as Assistant Superintendents to the Police (ASP). The Police Force recruits three direct ASPs every three years. Since my early days I have witnessed what a respected profession it was being a Police officer. Unlike nowadays, three decades ago, it was a highly regarded profession. So I did not think twice, but applied for the position. It was in 1985 and I have been selected for an interview from the basic exam along with 29 other applicants. I faced the interview very well and was confident that I would be selected to be one of the three ASPs. My beliefs were right when, I received the selection letter from the Defence Ministry that I was among the three selected as probationary ASPs. At the Police Academy in Kalutara I met the other two freshmen, S. M. Wickramasinghe and H. N. B. Ambanwala. With the passage of time, all three of us became Senior DIGs and Ambanwala retired a few months ago as he was senior to us in age. Now, only Wickramasinghe and I are left for the top post considering the seniority. "First of all the quality of the service should be improved. To do this the public impression towards the Police should be changed. And to change the public impression the attitudes of the Policemen towards the public should be changed. " Q How do you see present day Sri Lankan Police? Sri Lanka Police has a history of almost 150 years. As established by the British, for their basic needs like controlling the public, and enforcing their laws. Today it is not called a Department anymore, but Sri Lanka Police-a Police Force-which was set up to carry out traditional duties was changed in early 1970s with the insurrection of the Janatha Vimukthi Peramuna. Then it again changed with the terrorism unleashed by the Liberation Tigers of the Tamil Eelam (LTTE) and the ensuing war. With these significant turning points in history, traditional policing transformed to operational policing, where the Police had to effectively engage in a war-like situation and with operation duties rather than upholding mere law and order. But since the war is no more, the duty of the Police has to be changed again to address the present day issues of the public. This is why it has to change to a community Police today. It is a concept, where the Police have to work hand in hand with the community. It is a step moving a bit further from the traditional methods of maintaining law-and-order but to involve the public to work towards a safer environment. Q Whilst conducting your duties had there been any instances that you had to take tough decisions, which perhaps became unpopular afterwards? The most recent incident was the HNDA student protest that caused much an uproar. Apart from being in charge of the security of the Western Province, I was being appointed as the Acting IGP during this period, when I had to make sure the peace of the society would not be disturbed. The Police handled the situation well from the beginning of the protest march, but irresponsible action of one or a few officers, brought disgraced to the entire department. All the higher authorities including the political leaders were calling me that day asking about the advancing protest and how it would disturb the peace and mobility within the city. When I came to the street level the DIG Colombo had already taken necessary initiatives to stop and disperse the march at all costs. The decision was tough and as said it became unpopular later on but I had to take it at that moment to sustain law and order. "Secondly, the most important thing is to strengthen the harmony between the police and the public. In my career I have done so many programmes related to the community policing." Q There were certain allegations of inquiries of your conduct in the past. Do you have any ongoing probes at present? The National Police Commission held an inquiry into the Police attack on the HNDA student protest but it is now over. I gave evidence to the best of my knowledge and they were satisfied with that. Other than that, there are no other inquiries going on against me at present. Q Had there been any political pressure prevented you from conducting your duty unbiased which and what would you do if such pressure exerted in the future if you were appointed as the IGP? There are no such instances that I could recollect. If there were any political pressures that prevented me from carrying out my duties, I must frankly tell that I had been constantly avenged by the Police hierarchy from time to time. Since I was the SSP in charge of the Police Narcotics Bureau and until I became a Senior DIG I had to undergo various harassments from the senior officers, who personally did not like my conduct of duty. I have been given many transfers from time to time, which could be determined as not entirely due to the service requirements, but due to the personal requirements of certain senior officers. All these harassments started to come after the tenure of former IGP Chandra Fernando. He was a top officer, who believed in strict action against eradication of the drug menace and underworld crime. I managed to conduct my duties without any hindrance at the Police Narcotics Bureau during his period. Q If you become the Chief of Police, what important decisions would you take towards the betterment of the service and benefit of the public? There are two important expectations I want to achieve if I become the IGP. First of all the quality of the service should be improved. To do this the public impression towards the Police should be changed. And to change the public impression the attitudes of the Policemen towards the public should be changed. I’m not saying all Policemen are corrupt, but due to the unpleasant and unlawful activities of some, all are blamed. There are a lot of allegations against Policemen for taking bribes, to take action even on simple offences like the Traffic Law violations. I’m not trying to justify this but most of the officers tend to commit this due to the embarrassingly poor salaries they draw. Although the authorities were much focused on the benefits and the attractive salaries of the members of the other three forces, it is sad to say how they always turn a blind eye towards the Police. If I get a chance I would make sure that in the coming four years I would commit to upgrade the quality of the service by enhancing the reputation of the Policeman. Secondly, the most important thing is to strengthen the harmony between the police and the public. In my career I have done so many programmes related to the community policing. There you bond with the society to win their trust and get their assistance to fight crime. Then the communities are safe and vigilant, and there is less room for the criminals to operate. Q Outgoing Police Chief N. K. Illangakoon recently made an eye-opening remark that he never went behind anyone for the post of IGP. There are strong allegations that you and your competitors have launched various campaigns to get hold of this position. What do you have to say about that? For the last question Pujith said "Well, that was his personal view."... Mr. Snr DIGP you didn't understand the question well... Question was about allegations from no one, but wider society, but you thought it's an allegation levelled at you guys by Ex-IGP. Mr. Jayasundara, I know you're a great officer, but please listen to the question and understand well before you answering. DM is giving unfair publicity to Pujith. Today this full page interview. Yesterday a photo with outgoing IG, where Pujith's picture was irrelevant. Why not interviews with the other two in the fray? It is a great pity that canvasing by the two main candidates has been resorted to and should have been avoided, due to the IGP position is of special importance and should be given to a person who rises above all adverse influences and is of exemplary character and accomplishment. He should have the courage and strength to stand tall during adversities and the will to re-organise the police into dedicated public service. I respect him and may be he is personally goodbut after i watched some tv interviews that he was interviewed, i noticed that this person is not good to lead the police. all the time he uses to show that he is correct (even though he was wrong) and he was not ready to listen to the people or investigate police wrong doing. Police under his direct order doing again and again various unpopular things but he didn't take any actions. example police who are directly under him lie to the public openly. Since my early days I have witnessed what a respected profession it was being a Police officer. Unlike nowadays, three decades ago, it was a highly regarded profession. Well done to DM for this interview. It is in the public interest that we know the policies of the future IGP of Sri Lanka.Being a policeman in SL is a thankless job. The general public thinks policemen are bribetaking rogue who doesn't care about the welfare of the "non connected" citizen. The biggest job the future IG has is to change the mindset of the citizen that the police are for the people and not against the people.I hope the same chance will be given to other potential IG candidates as well. Wish u the best Pujitha. You are the most suitablee as u r not a political stooge. I think your vision towards upgrading police forces is the right things to do.Enhancing their perks would definitely change the mind set. Furthermore strict conduct towards politician and their interference towards your fellow officers duty and respect should be completely irradicate. I wish you a best of luck for your future endeavour and hope to see a unbiased , uncorrupted and respected police force in Sri Lanka.